Brazil has become the world’s sixth largest economy, having recently passed Britain and Italy, and has a dynamic and growing middle class, numbering more than 100 million. 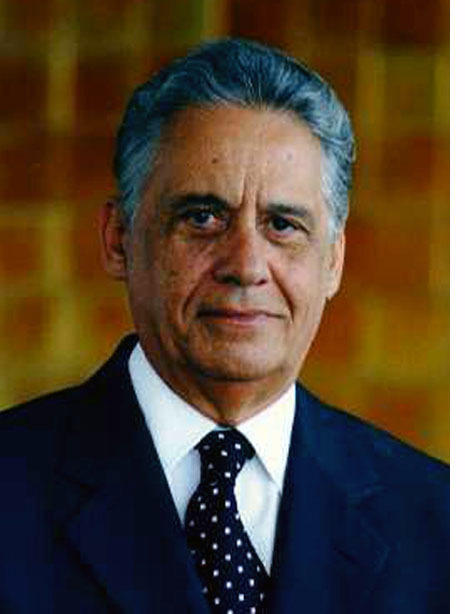 As president from 1995 through 2002 Mr. Cardoso was the primary architect of that rise. He presided over the elimination of hyperinflation and initiated sweeping social investment and income redistribution programs, which his two successors have extended and deepened. This is an irony that is missed by the gray lady—surprise, surprise. A Marxist, or at least Marxish sociology professor, becomes the president of Brazil and a leading advocate of what is popularly known as neoliberalism. Under Cardoso’s two terms (1995-2002), the economy did grow but at the expense of the working class, poor peasants and the indigenous peoples. Relatively few Brazilians have benefited from the economy. In a country with some of the world’s widest social differences, grinding poverty and misery coexist with great industrial wealth; 20 percent of the population is extremely poor and 1 percent extremely wealthy. Brazil’s Gini index in 1991 was 0.6366. According to the UN, Brazil had the most uneven distribution of wealth in the world in 1995. The richest 10 percent of Brazilians hold 65 percent of Brazil’s wealth (GDP), while the poorest 40 percent share only 7 percent. Brazil placed sixty-eighth out of 174 countries in the UN’s 1997 human development index. No other organization articulated the needs of the “other Brazil” better than the MST (Landless Workers Movement) that Cardoso’s cops repressed on numerous occasions. On April 17, 1996 military police killed nineteen landless farmers, who were members of the MST and had been demonstrating for the right to take over an unproductive ranch in Pará, Brazil. In Brazil 90 percent of the population lives on 10 percent of the land, so there is obviously a burning need for land redistribution. Despite expectations that the “radical” sociology professor who wrote so sensitively about slavery would stand up for the rights of indigenous peoples, encroachment on their land continued under his administration. In the first year of his rule, his Minister of Justice Nelson Jobim turned over Indian reservation land that equaled the size of Rhode Island to 14 ranchers. The Kluges again hit the headlines last year when three of their gamekeepers in America were convicted of killing federally-protected hawks, owls and even neighbourhood dogs. Kluge had organised an ‘authentic British shoot’ and invited his friends to come and kill imported pheasant and ducks. He feared his stock of game might be hurt or killed by its natural prey, so he ordered anything that would interfere with the good time slaughtered. The New York crowd merely guffawed at Kluge’s misfortune with the law, and he was in even greater demand at Manhattan’s most chic dinner tables. Kluge and his ilk have been labelled the ‘Nouvelle Society’, and nowhere were they more in evidence than at the recent spectacularly decadent seventieth birthday party of Malcolm Forbes in Morocco. Patricia’s fortieth birthday party at the Waldorf-Astoria was not quite on a par, but it was quite an event. From Britain came the Sangsters, the Frosts, Lord Grade but no royals, other than the ex-empress Farah of Iran and her son, Ali Reza (who proclaimed himself shah after his father’s death in 1980, so he is a sort of royal). Kluge, in his high-living, high-spending manifestation, fits in well with the new breed of celebrity entrepreneur who would make the American tycoons of yesteryear squirm with their brashness. The modern celebrity businessman loves the glare of publicity and the flash of the paparazzis’ cameras almost as much as he loves the money he makes. It is a world where wealth is not worth having unless it can be flaunted, and where no expense is seen as over the top. In Manhattan, Patricia has organised a three-floor penthouse over her husband’s office which is the last thing in glitz and bad taste: solid bronze electric doors, a waterfall that flows over one balcony, a huge sunken bar and sliding walls that rise between the dining room and the lounge at the touch of a button. In Virginia, there is a butler imported from England, and black servants dressed in antique livery for the bigger parties. ‘We live like we want to live, and it is nobody’s business but ours, ‘ Patricia replied to a critic of her lifestyle. Dying at the age of 95 in 2010, Kluge was named the richest man in America in 1986, largely through the profits made in the television business. So, like Alfred Nobel, the arms manufacturer, he set up a foundation to award prizes to the deserving. The question of Cardoso’s political evolution is intriguing. As the title of one of his books should indicate, “Dependency and Development in Latin America”, he is a “dependency theorist”. As someone who has written in support of dependency theory against its critics in the Robert Brenner school, I suppose I should be embarrassed to be connected in any way with some like Fernando Cardoso. Raúl Prebisch was much more than a sell-out, dear Lou! His origin was the pro-imperialist Partido Socialista of the 20s. He broke with the party and entered the Partido Socialista Independiente of De Tomaso and Pinedo, who provided the think tank for the establishment of the pro-imperialist regulatory regime that was imposed on the country during the early 30s. During those times, he worked as a primary official of the British imposed Central Bank of Argentina (this Central Bank was the carbon copy of the one that Sir Otto Niemeyer had failed to impose on India!) and from that post he developed a very particular form of Keynesianism, a Keynesianism aimed at keeping Argentina within the bonds of the imperialist regime, not at saving central capitalism from itself. Later on, Peronism swept away Pinedo, Prebisch and all this host of “pure” technicians of economics (of dependent economics) from the high positions in the financial and economic structure of the Argentinean state, while profiting from these structures to put the state to the service of self-centered economic development. This was an attempt to develop a bourgeois revolution without any revolution, a transformation of the role of the state by modifying the direction in which it moved. As opposed to figures like Cardoso and Prebisch, the theorists grouped around Monthly Review never lost sight of the revolutionary goal. In their ranks were Samir Amin, A.G. Frank and Immanuel Wallerstein. What some on the right and left shared in common was a professional affiliation with the UN’s Economic Commission on Latin America (ECLA). Both Frank and Cardoso worked there. 1. Capitalist development at the periphery is viable. 2. Underpaying labor in the periphery is not essential. 3. The local bourgeoisie is capable of leading dynamic growth. 4. The penetration by multinational firms does not have political consequences. 5. The only alternatives in Latin America are socialism or fascism. “I Travel Because I Have to, I Come Back Because I Love You” is a remarkable film being shown starting tomorrow at one of New York’s most remarkable institutions: Anthology Film Archives. First, some words about the film and then some about the institution. As soon as I figured out what the film was about, my immediate reaction was to eject the screener from my DVD player. This Brazilian film, co-directed by Karim Ainouz and Marcelo Gomes, has only one character—a 35 year old unnamed and unseen geologist (Irandhir Santos) who is driving around northeastern Brazil in proximity to the site of a new canal that he works on. We see the desolate but beautiful flatlands from his perspective, mostly behind the wheel of a car, while listening to a nearly stream of consciousness voiceover about the people he knows in the region, as well as a woman named Blondie who he has just split up from. I was skeptical that drama could be eked out of what amounts to a single-character screenplay. Thankfully, I was rewarded by one of the more penetrating psychological portraits in a very long time, mixing existential angst with oblique reflections about the impact of environmental change of the kind that is transforming Brazil as radically as China. In an odd way, the geologist has an affinity for the Brazilian underclass reminiscent of the artist Vik Muniz whose collaboration with the recyclers working in the vast landfill Gramacho elevated them to the same status as the artwork they recreated. Unlike Muniz, however, there’s a psychological gulf between him and the prostitutes, shoemakers and other characters he meets on his peregrinations. They describe their hopes and their fears to him, while he reserves his own for those viewing the film, those privileged to hear his self-doubts and fears. Much of the film consists of silent vistas of the Brazilian countryside that is about as flat in this region as Texas. Indeed, I had the same sort of forlorn feeling that the geologist had as I used to navigate the back-country roads just beyond Houston in the mid-1970s. Unlike the geologist, I had a sense of solidarity with the socialists I had joined down there, although it was rapidly eroding. The final scenes in the film consist of the geologist surveying the town that is about to be inundated with water, a necessary result of Brazil’s relentless modernization. He does not render a political judgment on the changes taking place but you cannot be left without a feeling that the changes—that he is in the vanguard of fomenting—leave him as empty as the love affair that has just ended in failure. Defying conventional expectations of film-making, the directors have found exactly the right venue to present their work. Disposable entertainment, indeed. As I look desperately for a movie in my own neighborhood at the local Cineplex, I often feel as frustrated as trying to find a book to read in an airport magazine stand. TC: You sometimes make short films, as personal exercises leading up to longer work. I saw one of those shorts about a small jail in an arid place and how characters both in and out of the jail relate to that space. Tell me about that creative process. KA: There is a big contradiction in my relationship to filmmaking. Ultimately film is a means of expression and communication. You do a film so people can see it, and that’s why sometimes I think I’m in the wrong place. I have a really hard time letting my films be public. The film that you mentioned, Happiness Lives Here, was done in 1997 and I never fully finished it. Filmmaking for me relates to writing a diary. It’s a personal expression of what I believe, how I see the world, and how I relate to people. So those short exercises are the part of my filmmaking that I like to keep to myself. I like making feature films for different reasons: communication, working with a crew, making creative partners, and developing a project over time. Filmmaking is so much about the audience and the reception, and yet there’s something very personal about it that I can’t let go of. Check http://anthologyfilmarchives.org/ for scheduling information on this most interesting work.